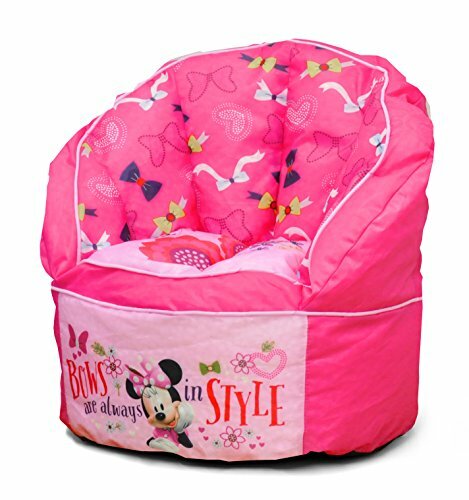 Brighten your child's room with the Disney Minnie Mouse toddler bean bag chair. With its soft bean filling, the comfy seat is ideal for reading, playing games, and relaxing. It is lightweight - easy to move from room to room. The nylon fabrication is spot clean only. Ideal for 2-6 years of age. Dimensions: 22" H x 22" W x 18"L.
Perfect for any Minnie Mouse fan! Perfect for reading, playing, and relaxing! 100% nylon - filled in the USA! Cam & Kalleia | Bean Bag Stuffed Animal Storage Chair | Cute Toy Organizer Beanbag Containers to Create Extra Space at Home Storing Kids or Teens Plush Cushions, Soft Bed Sheets, and More!